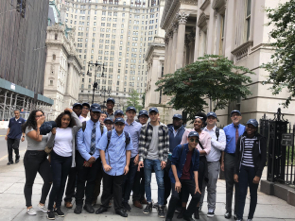 WHSAD students learned a great deal about building codes and zoning in New York City when they visited the Department of Buildings. 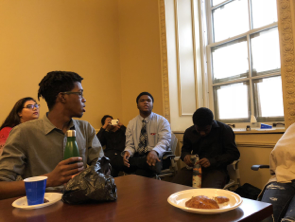 Student correspondent Antonio Perez reports on his and his peers’ visit to the Department of Buildings. On October 2nd, WHSAD students had the opportunity to visit the Department of Buildings to attend a panel on zoning and building codes. While many people may not be aware of what building codes exactly are, they do affect everyone and the way they live their daily lives in some form. Building codes are a set of rules and a set structure that buildings must adhere to in order to be able to be constructed. Building codes help to keep safety and order by ensuring that all structures are built in a way that is ready and prepared for all possible situations. An example of such is a house which is built off the water. This house must be constructed with specific safety measures and precautions in mind. While building codes designate how a structure should be built, zoning regulations designate where structures can be built. Zoning designates how and specific portions of a given area are divided. One area may be designated as a strictly industrial area; this means that only factories may be constructed in this area. Zoning is important because it separates uses which are considered to be “incompatible.” Zoning is also used to prevent new structures and or projects from interfering with existing uses and to preserve the “character” and feel of a communities. While many may not realize, zoning and building codes go hand and hand, building codes regulate the specific rules that new developments must meet while zoning regulates where these structures can be built. The main purpose for both zoning and building codes is to preserve the well-being of communities and citizens. During the panel, the effects of rezoning in modern day society were discussed in detail. An example of rezoning is the Domino Sugar Park Refinery by the Williamsburg waterfront. Recently, the factory, which has been out of commission for years, was rezoned from an industrial area to a commercial/recreational area. Now it is known as Domino Park, an area for families and their neighborhood to come and relax. Senior Dante Meade asks a question of the panel hosts. A particular part of the panel which stood out to many was a question posed by WHSAD Senior Joseph Balbuena when he said, “Regarding the topic of rezoning, how is it that rezoning has impacted gentrification occurring in lower income areas of the city? Furthermore how does rezoning then affect lower income citizens who now have to move out?” This is an important question to ask because unfortunately many people in our community are affected by gentrification. People who had lived in the same areas for years are forced to move out of these areas they associate with home because they simply couldn’t keep up with the high costs. The City’s schools are filled with future architects and engineers, and these young people will build our City for decades to come. One day, these students will be responsible for adding to and strengthening our built environment, which makes it all the more important that we get them interested in math and science at an early age. More programs, similar to the Department’s Junior Architects and Engineers program, should be designed to foster interest in the building trades, science, technology, engineering, and mathematics fields. We are a diverse global community and that should be reflected in the design world. As burgeoning design professionals seek opportunities to join groups that reflect your interest and start chapters at your school. There are several organizations that encourage student involvement beginning as early as kindergarten. The goal is to encourage students in grades K–12 to attend college and pursue technical degrees. These groups provide mentoring and help students develop leadership skills through hands on activities. Check out the following organizations: National Society of Black Engineers (NSBE), Society of Hispanic Professional Engineers Junior (SHPE Jr.), National Organization of Minority Architects. I recommend students, meet and form a committee, identify the goals and objectives, prepare a written proposal, and obtain buy-in/support from mentors, organizations, etc. follow your passion. The construction of any building starts with an idea, and students represent the next generation of builders and designers whose ideas will shape the landscape of New York City. Your passion will shape your future. Find a mantra or motivational quote you call upon when you feel like giving up. When I was faced with challenges, I would say, Failure is not an option!